Thank you for the opportunity to serve you this year as your 1st Vice commander. 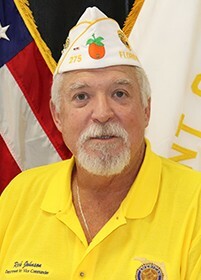 As that being said, I oversee with the Department Commander Zone 1 of the American Legion. We have a tough road ahead of us. I need all District and Area Commanders to come up with a plan for the year and get your web site updated with any special dates or activities that are coming up. It make it so much easier for our family members to search for resources that is out there for them. I look forward to working with everyone this year and PLEASE if you need any help at all, please call me or e-mail me anytime as we will work together to make this Department the best out there. Let’s be visible this year and get out and let these Post know who you are and how you can help them. We need to think outside the box this year and come up with great ideas to get these programs working out with in the communities. I will be working hard with the Commander this year and see who needs help out there. Please feel free to contact me anytime either by phone or e-mail. As we celebrate 100 Years of our great organization, let’s have fun doing it. There are a lot of Post and Districts planning events for that. Let us have another great 100 Years with the help of our younger veterans and their kids. It is our responsibility to pay it forward and the time is NOW. So let’s have a great time this year as I look forward to working with everyone.